While developing one project, I have a requirement of getting table data in grid. The table contains many records and need to be fetched accordingly. 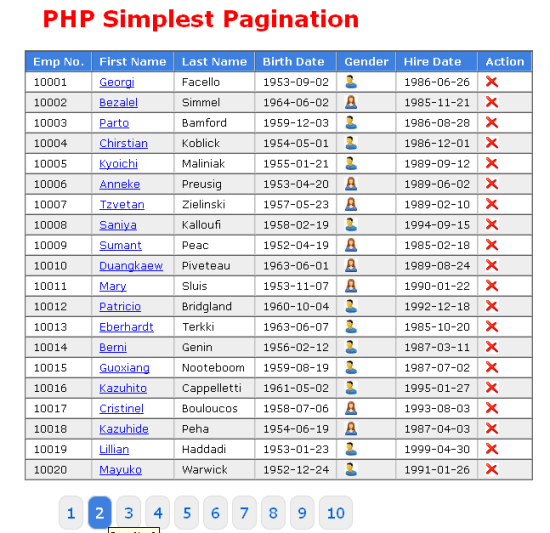 I started googling “PHP pagination class” and “PHP pagination library” and come across hundreds of free/ open source PHP pagination library. Since I am not using any framework, I don’t want to use any ready-made pagination library and hence decided to write my own very easy, simplest php pagination library. Today I am going to share that library (here its not a library/class but two simple php function). To show large numbers of records into pagination you require offset, and range. Apart from that you need a page number series on which user click and load the required page records. I have created two functions, first to get data from database table using offset, and page no. Second, to generate page navigation list for user. And following function is used to generate page navigation list. Later I used jquery to delete the record from table on the fly. Following is a jquery code. The final Output will look like below.